Ryder's Savage Jerky is a brand that launched in 2017 by Monica Willoughby based out of Sacramento, CA. Monica currently markets her jerky at local farmers markets, street fairs, and online through Facebook, Twitter, and Instagram. She started the business as a way to create a college fund for her 5-year old son Ryder. Last year she launched a crowdfunding campaign to secure licenses, materials, and equipment. Last month she got a boost after being featured on a television news show in Sacramento. This Teriyaki beef jerky has no other marketed claims other than its name, "Teriyaki". The first flavors I taste is a teriyaki sauce, with a fair amount of sweet and a light salt. The chewing brings on an aged natural meat flavor, with hints of soy sauce. For being marketed as "Teriyaki" this delivers a clearly identifiable teriyaki sauce, and one that seems to have a light fermented flavor, and a faint ginger, both ingredients that I think true teriyaki should have. The ginger is perhaps too light, however. It has a good level of sweetness, and a noticeable soy sauce. Overall, it has a convincing teriyaki flavor. 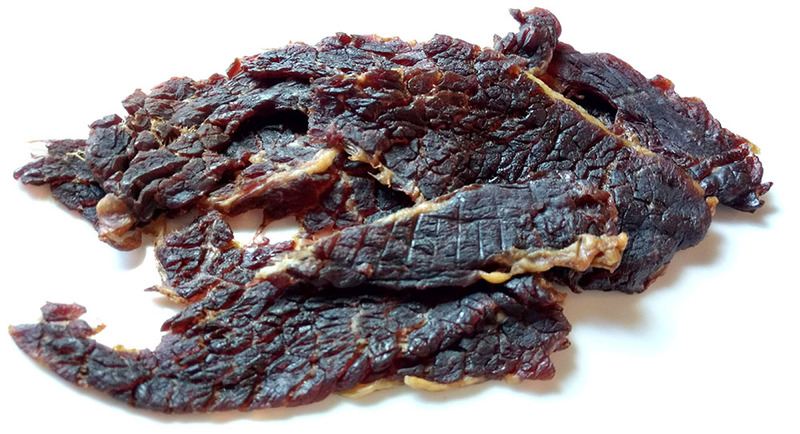 Otherwise, the primary taste profile of this jerky is the teriyaki sauce, with a noticeable weight on the sweet and soy sauce, a light fermented flavor, and just hints of ginger. There's a light natural meat flavor at the end. The meat consistency is overall good. These are slabs sliced thin and still retain a chewiness, however, and once chewed down soft, they have a steak-like texture. Unlike other flavors sold by Ryder's Savage Jerky, these slices are semi-moist and sticky, not dry and lightly crunchy. I do see a fair amount of fat streaks on these slabs and even a little bit of gristle. Nothing unchewable noted, though a fair amount of stringiness. This Teriyaki from Ryder's Savage Jerky dishes out a very typical teriyaki sauce flavor, though weighted a little more on the sweet and soy sauce, and less on the ferment and ginger. It actually tastes much like name brand teriyaki, e.g. Yoshida's or Kikkoman. That in itself is not a negative since many brands of teriyaki jerky are done that way. 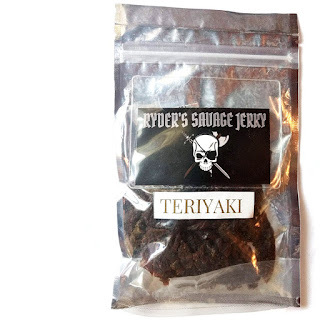 In this case, Ryder's Savage Jerky could have touched up the teriyaki by adding more Mirin and bits of chopped ginger to help boost that authentic flavor. My biggest criticism is that this jerky is too plain, it's just basic teriyaki sauce, and nothing creative, nothing extra. On the other hand, I like the natural meat flavor that comes in the end, and the chewing texture is very steak-like, just a bit too much stringiness.